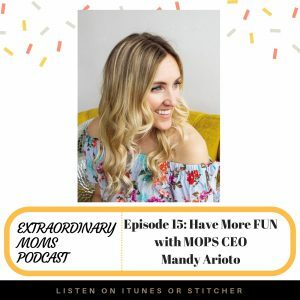 Mandy Arioto is International CEO of MOPS and is known to thousands worldwide as a lively storyteller, a force of hope, and an audacious risk-taker. In her new book, Have More Fun: How to Be Remarkable, Stop Feeling Stuck, and Start Enjoying Life (on sale TODAY!). We talk about her motherhood journey, how she worked her way up in the MOPS organization, and how having more fun changed her family for the better. Such a great conversation!